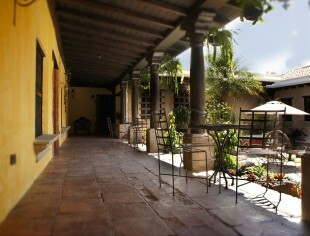 The hotel is ideally located in a quiet neighborhood on the south side of Antigua but still close the Plaza Central. 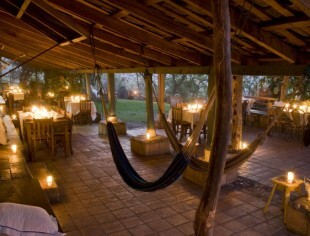 Panza Verde was one of the first small luxury European style B&B in Guatemala. The beautiful colonial house is enormous; its arches, domes, columns and terraces were all designed after a small church in Antigua. A recent remodeling has brought the total number of rooms to 12; 9 suites and 3 double rooms. Each of the rooms has its own personality and is decorated with Spanish colonial antiques, handmade textiles, original art and turn of the century chandeliers. Amenities include fire places, bathrobes and fresh flowers. 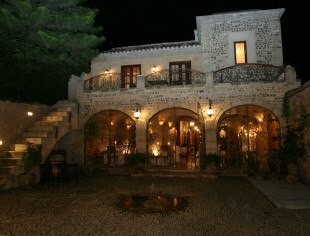 The Panza Verde restaurant is well known for its fine cuisine and ranked in the top 3 in the country. A beautifully restored Spanish colonial style mansion. This upscale boutique hotel is located just a few steps from the main square in Antigua and hosts thirteen rooms and suites. All the rooms have a wonderful view of the lush green central courtyard. Each room and suite is named to honor a key figure in the conquest of Guatemala. All of the details throughout the entire hotel have been carefully chosen to highlight the essence of colonial life back in the XVI century. Located on a cobblestone street across from the legendary Capuchinas Convent, in the heart of Antigua Guatemala, this boutique hotel offers elegance and comfort. In all of the 26 spacious suites you will find a well-balanced blend of tasteful and elegant details in sync with the traditional colonial architecture and surroundings. The restaurant is one of the best in town. Built among the ruins of an old Dominican monastery, this 5star hotel offers 125 rooms where you can experience the ‘monastic’ life in modern comfort. Antiques, spacious corridors, statues and painting, artistically presented with tropical flowers, plants and hundreds of lit candles, create the magic and nostalgia of Casa Santo Domingo. Jacuzzis, swimming pool, in-room fireplaces and an excellent restaurant will make your stay here a memorable experience. Meson de Maria is located in the heart of La Antigua Guatemala, just a few steps from the Calle del Arco, which is the main street and just 150 meters from the Main Plaza. 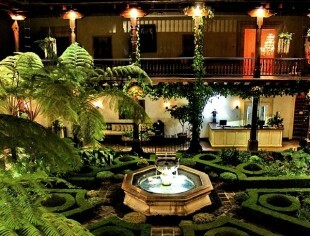 The hotel is built in harmony with the colonial style and beauty of La Antigua Guatemala. A lot of attention to detail in decoration is found not only throughout the hotel but also in the well-appointed rooms. The roof top terrace offers views of the Agua, Fuego and Acatenango volcanoes which surround the Panchoy valley. The setting of this hacienda style hotel, located at the outskirts of Antigua but still within walking distance from the main square, is truly spectacular. The colorful garden is huge and beautifully maintained, one of the nicest in Guatemala, offers stunning views of the surrounding volcanoes. 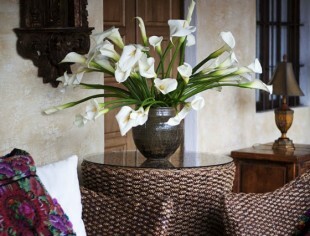 Special care has also been given to the decoration, native furniture and fabrics are used throughout the hotel. The hotel offers 8 double rooms with private bath, fireplace, mini-bar and cable TV. Six new garden rooms were added recently. Apart from the rooms, the hotel offers 5 casitas (small homes) with all the comforts from home; living room with fireplace, dining room, fully equipped kitchen and 2 bedrooms. Los Olivos offers 20 rooms with colonial design and comfort, literally steps away from the Plaza Central in the center of Antigua. The onsite restaurant is fully recommendable as are its garden or indoor patios and the rooftop terrace with impressive views of the Agua volcano. Luxury boutique hotel with colonial design right in the heart of Antigua, just a few steps from the Arco Santa Catalina which is probably the most emblematic and photographic highlight on 5th Avenue. The hotel has several elegant courtyards and patios where you can enjoy the tranquility and beauty of the property with a glass of wine or some excellent Guatemalan coffee. There are 7 rooms in total, all with different architectural touches. 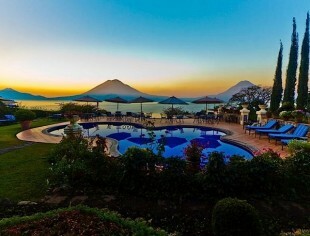 This beautiful hacienda style hotel surrounded by immaculately maintained colorful gardens sits quietly in a perfect spot on the shores of Lake Atitlán, guaranteeing stunning views from all angles of the lake and surrounding volcanoes. The decoration at the hotel; hand carved furniture, colonial statues, corridors with gorgeous ceramic tiles completes the overall atmosphere of classical elegance. Casa Palopo is a beautiful villa nestled in the hills around the village of Santa Catarina Palopo situated on the shores of Lake Atitlán. The hotel offers a total of 8 rooms; 4 suites and 4 double rooms. Each suite is tastefully furnished and even the bathrooms have floor-to-ceiling windows plus private sun decks. Every suite is painted in bright colors and decorated with furniture that evokes Guatemala’s Mayan heritage. 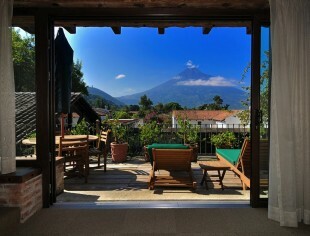 All have spectacular views of the lake and volcanoes. The restaurant offers international cuisine with a Guatemalan twist. 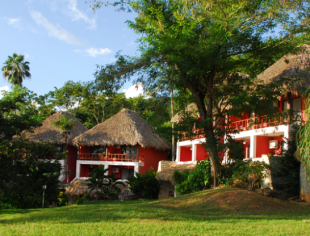 The hotel is located inside the nature reserve of Cerro Cahuí on the northern shore of Lake Peten Itza. Camino Real Tikal offers 72 deluxe rooms, all with air conditioning, balcony and view of the lake. Villa Maya is located in a vast private nature reserve on the shores of Petenchel and Monifata lagoons. Villa Maya offers 56 rooms, all with private bathroom, hot water, air conditioning and private balcony to enjoy magnificent views of the lagoon, tropical forest and exotic gardens. The resort is hidden away among the dense jungle that covers the shores of Lake Peten Itzá. La Lancha Resort offers a total of 10 casitas. Each casita is brightly decorated, inspired by native art furnishings. The Rainforest Casitas have a view of the surrounding forest and partial view of the lake, while the Lakeview Casitas offer a breathtaking view of Lake Peten Itzá. The restaurant offers delicious Guatemalan and international cuisine. 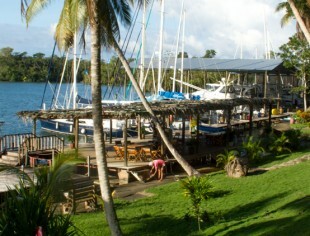 The Marina Nana Juana hotel is located within a large property located along the banks of the Rio Dulce river. The hotel offers all the amenities to make your stay on the Caribbean side of Guatemala a pleasant one. The 36 rooms (Standard, Junior Suites and Master Suites) are spread throughout the entire property. Utz-Tzaba is a beautiful beach hotel right on the black sand beach of Moterrico. The hotel offers 10 rooms and 4 bungalows. The rooms are spacious and comfortable with private bathroom and hot water. The bungalows provide the comfort from home; a fully equipped living and dining room, kitchen and 2 bedrooms. You can enjoy a swimming pool and Jacuzzi. The restaurant offers a wide variety menu of excellent quality. This charming hotel is located in the heart of the small town of Copán Ruinas overlooking the Central Plaza. The hotel has been in operation for more than 60 years and has set the standard for tourism in the Copán region. Marina Copán offers 50 spacious rooms and suites designed in a classical colonial style. 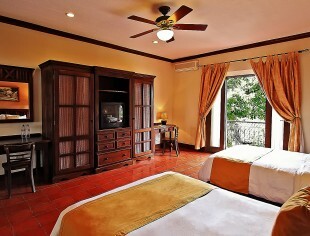 All rooms are fully furnished with air conditioning, ceiling fans and cable TV. This 100 year old, family owned, hacienda is nestled in hills above the Copán Valley and located very close to the Mayan ruins of Copán. The hacienda was restored to its original design using local materials and labor and was converted into an eco-lodge in the year 2000. 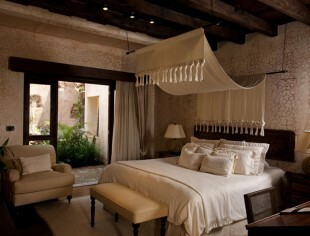 Hacienda San Lucas offers 8 distinctive rooms with private bath, hot water, solar lighting and ceiling fans. The full service restaurant offers exquisite candle light dinners.